The computational seismology group at ETH Zurich is seeking a motivated and enthusiastic candidate for a postdoctoral researcher position. 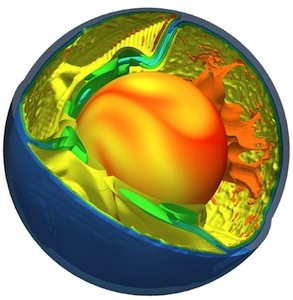 The position is part of the project “GeoScale: A framework for multiscale seismic modeling and inversion” funded under the Swiss Platform for Advanced Scientific Computing (PASC). Working within a team of seismologists, applied mathematicians and computer scientists, the successful candidate will contribute to the development and application of a global multi-scale full waveform inversion that can harness modern high-performance computing resources. The project will be conducted in collaboration with the research group of Prof.Olaf Schenk at the Universita della Svizzera italiana (USI) in Lugano. The Department of Earth Sciences at ETH Zurich provides a unique research environment covering a wide range of geo-scientific fields. Research in computational seismology is focussed on the development of numerical wave propagation applications, full seismic waveform inversion on all scales, seismic interferometry and earthquake physics. Strong links exist with groups working in exploration geophysics and statistical Seismology. In addition to opportunities at ETH, the Swiss National Supercomputing Center (CSCS) provides access to state-of-the-art high-performance computing facilities, as well as educational programs. This is complemented by the close collaboration between Computational Seismology at ETH and the Institute of Computational Science at USI, especially withing the GeoScale project. Development of a data management framework for the scalable parallel processing and measurement of large seismic waveform data sets directly on HPC systems. Development of a global multi-scale full waveform inversion scheme for crustal and mantle structure. Development and implementation of efficient non-linear optimisation schemes, including the design of preconditioners and resolution analysis tools. The PostDoc is expected to hold a PhD in Geophysics, Computer Science, Computational Mathematics or a related field with a focus on seismology, numerical simulation, and scientific and parallel computing. Experience in a programming language like C, C++, FORTRAN and scripting languages is mandatory. Documented interest towards HPC systems, seismic inversion, and nonlinear optimisation is regarded as an advantage. Solid written and spoken English is required to publish results and present them at conferences and in journals. The position is of 2 years¹ duration and will be funded by PASC under the GeoScale project, with November 1st 2013 as earliest starting date. The position will remain open until filled. Applications or requests for further information may be sent to Andreas Fichtner (andreas.fichtner@erdw.ethz.ch). Your application should include a motivational letter (2 pages maximum), a CV, and two contacts for references.